we are about 2 hours drive mostly on autoroute. Daily departure at 23:00 from Portsmouth arriving at Le Havre at 07:30 the following morning. Daily departure at 17:00 from Le Havre arriving at Portsmouth at 21:30. Daily departure at 20:00 from Le Havre arriving at midnight in Newhaven. Daily departure at 12:30 from Newhaven arriving at 18:30 in Le Havre. From Lisieux take the D579 to Vimoutiers. From Vimoutiers take the D979 towards Alençon for 5 km, then take the left turn onto the D12 heading for L'Aigle and Ticheville. Turn left opposite the church, and we are 20 m down on the right. From Caen (ouistreham port) 1 hr, follow signs for Saint Pierre sur Dives, Livarot, Vimoutiers, and the directions above from there. have all the Dover to Calais crossings. From Paris (2 hrs), there are various routes, fast or scenic, you'll need a map or a route planner. 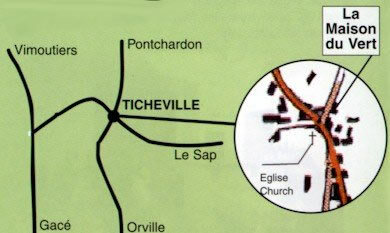 www.viamichelin.com Michelin have an excellent route planner, just enter Ticheville post code 61120 as your destination. There is private, safe parking opposite the hotel. 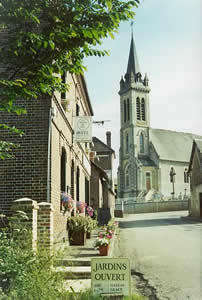 La Maison du Vert is a Vegetarian Hotel and Restaurant in Normandy, France. Situated in a stunning valley with 2.5 Acres of beautiful landscaped gardens. We are the perfect place to come for a relaxing holiday or short break. The Vegetarian Restaurant at La Maison du Vert is here to serve you delicious gourmet vegetarian and Vegan menus with plenty of choice. Over the past 5 years our restaurant has gained an excellent reputation with locals and tourists visiting from all over the world. Our cuisine reflects this, offering flavour sensations from all corners of the globe, perfectly combined in our completely vegetarian kitchen.